Not many parties get their own book but VE Day was the mother of all parties, A fascinating read and revelation. Its also a great read and uplifting. DESCRIPTION: Not many parties get their own book but VE Day was the mother of all parties, A fascinating read and revelation. Its also a great read and uplifting. The foreword by Frederick Forsyth is one of the most appropriate forewords this reviewer has read and it sets the scene for a book that manages to convey something of the unique celebrations that swept through Great Britain at the end of the war in Europe. The war in the Far East still a way to run and on VE Day those who followed the conflict there could not expect victory for many months and possibly for years. The planning to drop nuclear weapons was known only to a few and even they were far from sure that the weapons would work, much less cause instant Japanese surrender. Through the period it had run, the war with Japan was a largely forgotten conflict for Europeans. Those with relatives fighting in the Far East might have found their VE Day enthusiasms muted but for most the overwhelming joy of freedom from war in the homeland was blotting out everything else. Those who were there are few in number now and becoming fewer by the day. For everyone else it is difficult to fully appreciate how significant the celebrations were. Great Britain had suffered total war. For much of the period from 1939, German bombers had carried out terror raids on British civilians and even deliberately targeted historic cities with the intention of destroying buildings that has stood since before the Middle Ages. From the end of 1940, German air raids had begun to reduce and were rarely carried out in daylight. RAF and USAAF bombers had been steadily increasing their raids on Germany and the population were becoming more likely to hear Allied aircraft than German. Then, as German aircraft were becoming very rare visitors, the V Weapons began to arrive and there was concern that they would prove much more damaging than aircraft. The population had gone on a roller coaster ride to hell. The first two years of war had seen a succession of reverses and the high probability of a German invasion. It was not to be until 1942, when the British assault at El Alamein forced the German Afrika Korps back, that there was any real prospect of eventual victory. The news of new victories began to roll in and the British could start to believe in victory rather than depend on hope for it. The Normandy landings were a huge boost, but nothing had really changed for the better on the Home Front. The War in the Atlantic might have turned in the Allied favour, but rationing was not only maintained, but tightened further. The blackout was maintained, civilian vehicles were not much in evidence and most of the people on the streets wore some sort of uniform, many of them being foreign uniforms. As the V Weapons began arriving it was starting to look a less assured future. When the death of Hitler was announced, followed by the surrender of German forces, the sense of relief was fantastic. A war that has seemed likely to rumble on for ever was suddenly at an end. The lights were turned on again and civilians and service personnel alike were determined to celebrate. For those who were not there, it is impossible today to fully appreciate the mood. The sudden contrast between total war and peace was incredible and unique because there had never been a war like that before. 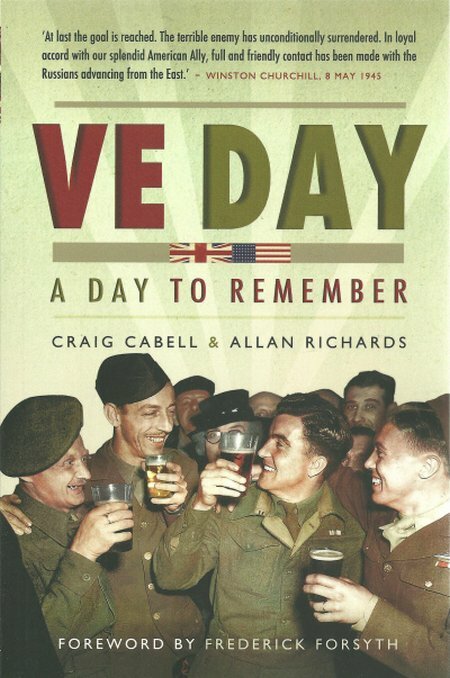 The authors have produced a book that reads smoothly and presents the many facets of VE Day. Looking back from here the difficulty is that we can see how much had not changed. Britain was still a grey place, and continued to be for another six years or so as the Atlee Government worked hard to squander the peace, maintaining rationing even as it was ending in Germany and the other ravaged countries of Europe. This is an informing and delightful book and the readable text is very effectively supported by a well-selected set of photo plates.